Festive lights and Spasskaya Tower of the Moscow Kremlin on Red Square. 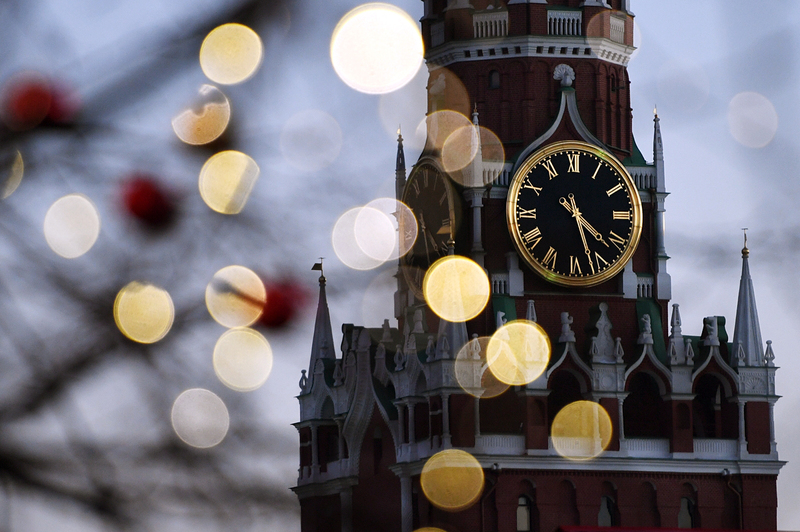 The clock on the Spasskaya Tower of the Moscow Kremlin is not only a symbol of Moscow — it is also an important symbol of the New Year holiday. The ringing of these chimes at midnight officially welcomes in the new year, and according to tradition, wishes made between the first and last ringing will definitely come true. RBTH presents 10 facts about this important timepiece. The first Kremlin clock dates from 1404. At that time it was located not on the tower, but on the arch at the entrance of the residence of Grand Prince Vasili III. According to the chronicles, which are the earliest record of the history of Russia, the first clock was made and set by a Serbian monk named Lazarus. In 1624, that clock was sold to a monastery in Yaroslavl; a new one was set into the Spasskaya Tower a year later. The Kremlin chimes were manufactured and set in 1625 under the supervision of English engineer Christopher Galloway, who proposed adding a tent above them. During his travels across Europe, Peter the Great bought a gigantic clock in Amsterdam. It was put into the tower in 1706-1709. The mechanism in the modern clock was made by the Butenop brothers from Denmark in the first quarter of the 19th century. In the 18th century, the clock face weighed more than 880 lbs. It was made of wooden boards hammered together and painted sky blue. It was divided into 17 parts, and the hours were designated by capital letters in the Slavic alphabet. The circle was decorated with images of golden and silver stars, the sun and the moon. It did not have traditional clock hands, but rather the sun in the center had two very long rays that acted as hands. The hands themselves did not turn — the sun itself rotated throughout the day. The clock started to strike when the first light shone on the Spasskaya Tower, and when it began to get dark, the clocks switched to a night track. Every 16 days, the proportion of day and night hours changed and the clock needed to be reset. In 1705, by decree of Peter the Great, the chimes were redesigned according to the German model with a 12-hour clock. In the process, the golden details on the clock were replaced. In the 19th century, the copper figures and minute divisions made by the Butenop brothers were covered with pure gold and the iron clock hands were wrapped with copper and covered with gold leaf. In 1932, the Soviet Union used 28 kilograms of gold to gild the rim, figures and hands. In 1925, the Butenop brothers set four iron clock faces on each side of the tower. Later, in 1999, a remainder of the oldest clock face was discovered on one of the sides: figures painted on white stone. Many of the clock’s bells are cast like the church bells with icons and bas-reliefs. Today, nine bells ring the chimes — the quarter-hour bell weighs 705 lbs and the hour bell, 4,700 lbs. Until 1937, the clocks had to be set by hand twice a day. Today this process is completely mechanized. Previously, cast iron weights weighing up to 440 lbs were alternately raised up using a special winch. Now the clocks are set by three electric motors, and every 15 minutes a special mechanism rings the bells. The Butenop brothers were planning to set the Russian anthem “God Save the Tsar!”, but Emperor Nicholas II rejected this idea. He declared that the clock could play any melody except for the national anthem. Until 1917, the clocks played "March of the Preobrazhensky Regiment" and " The Glory of Our Lord in Zion” four times a day. In 1918, following a decree by Vladimir Lenin, the clock, which had been damaged during the revolution, was restored and set to play “The Internationale.” It chimed this revolutionary anthem until 1938. 9. The clock was silent for 58 years. In 1938, the clock chimes fell silent. Instead it only struck each hour and a quarter-hour. During a renovation in 1974, the mechanism was fully dismantled and repaired, but a special commission concluded that it was not appropriate for the Spasskaya Tower bells to play the anthem of the Soviet Union. The silence was broken only in 1996, during the second inauguration of Russian President Boris Yeltsin. The chimes played Glinka’s “Patriotic Song,” which was then the Russian anthem. The peal of the Kremlin chimes on New Year was first heard on the radio in 1923. Later, they were shown on TV, and millions of Russians still watch them chime on New Year’s Eve today. Traditionally, a few minutes before the clock chimes, the Russian president gives his New Year speech from the Kremlin. According to tradition, if you make a wish between the first and the last chimes, it will definitely come true.